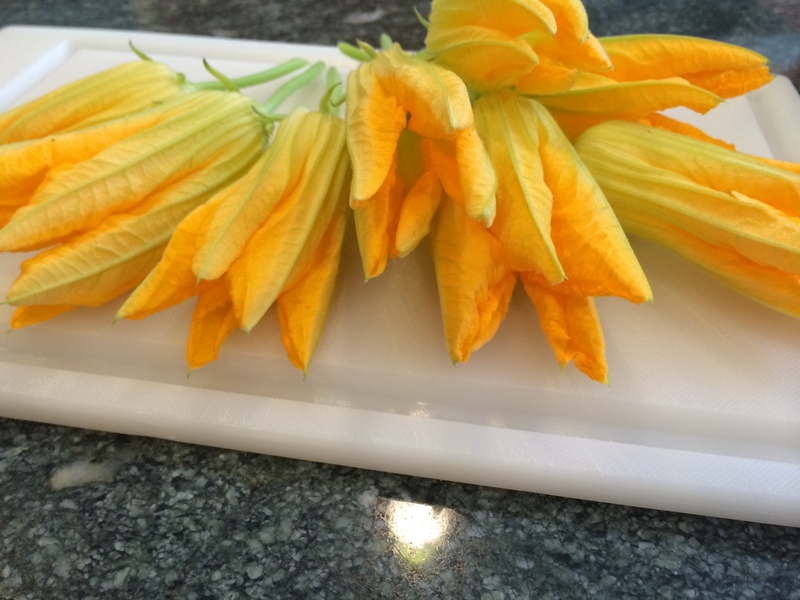 Today’s post actually features 3 recipes, all of which use ingredients from my thriving garden. My mom had invited a few neighbors over for lunch, and to me this was an excellent opportunity to try out some new recipes. 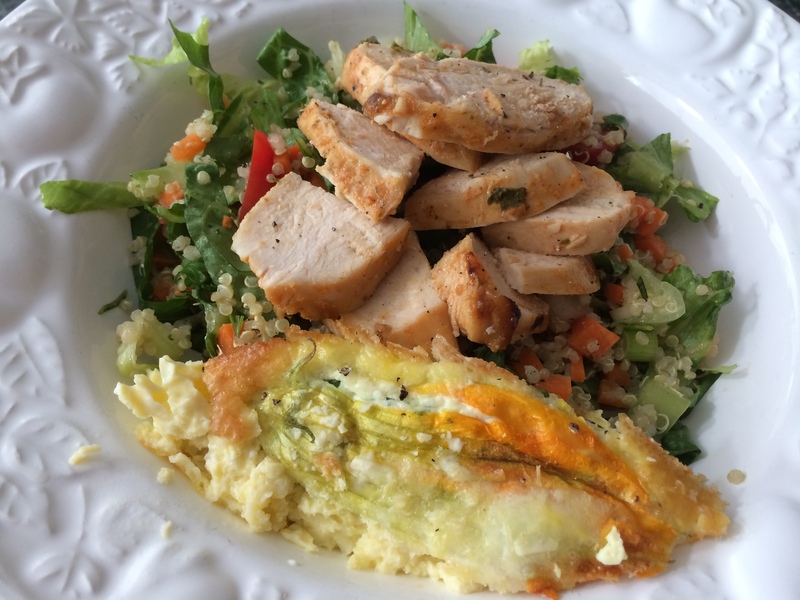 I served this Herbed Quinoa Garden Veggie Salad from Pinch of Yum, Honey Sriracha Chicken based on this recipe for Honey Chipotle Chicken from How Sweet It Is, and Squash Blossom Frittata based on this recipe from Beth Dunham’s blog. So here is my garden as of today. 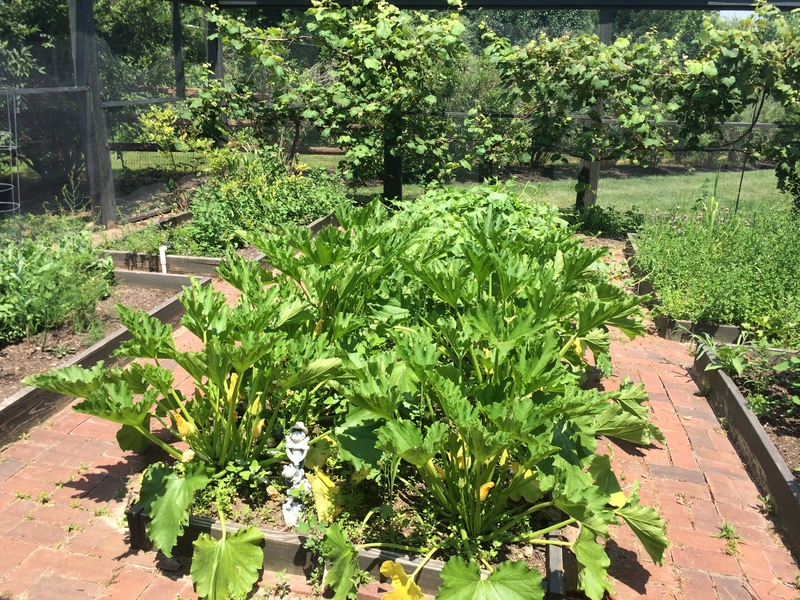 Front and center are the summer squash plants. 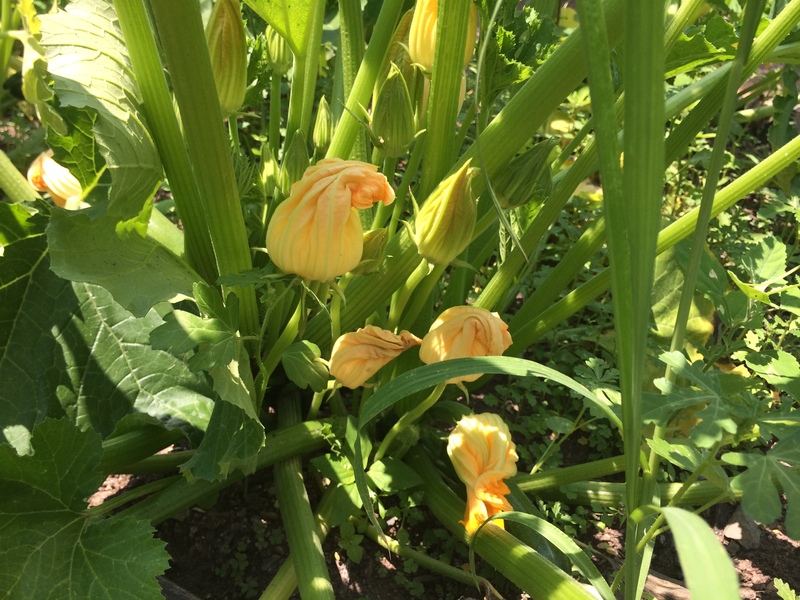 At this point, I am still waiting on the sugar snap peas, tomatoes and cucumbers, but a few summer squash have appeared adorned with BEAUTIFUL blossoms. I had to check inside the blossoms I picked because in several of them sat a big bee. Picked and ready to go! 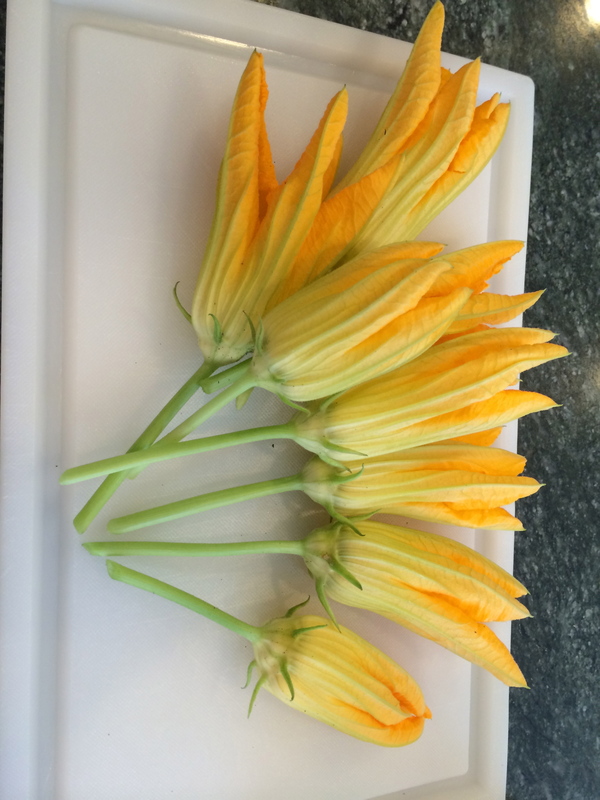 The first time we planted zucchini, I was pleasantly surprised that blossoms appeared as well. This year, I planned ahead and made sure to select seeds for a variety that would definitely produce flowers. My first experience with these was when I studied abroad in Rome during college. 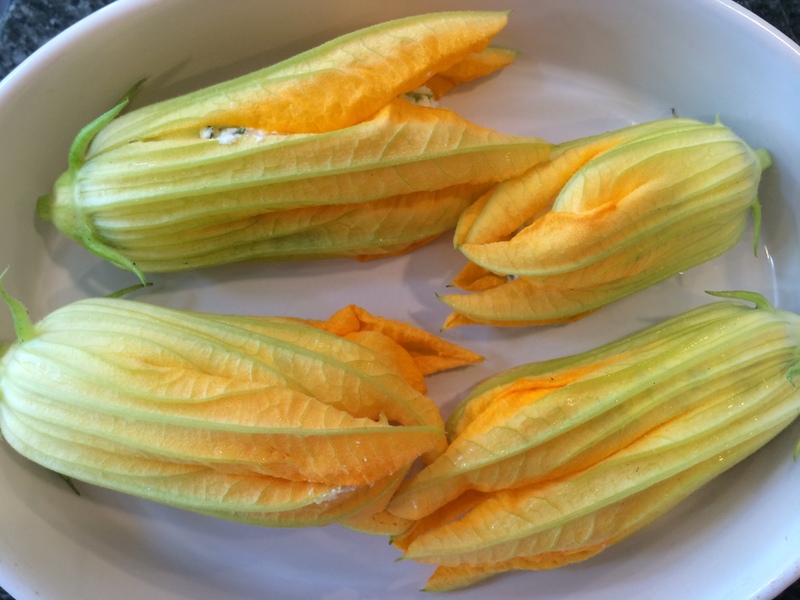 One of my good friends, Julianna, had been telling us all about a dish her grandmother prepared with zucchini blossoms. I had never heard of such a thing, but I was intrigued. Luckily our walk to class from our apartment passed an extensive outdoor market, and of course there were these blossoms. Julianna prepared them for us one night, and I was in love. They are so delicate with a creamy floral flavor. And so pretty too. 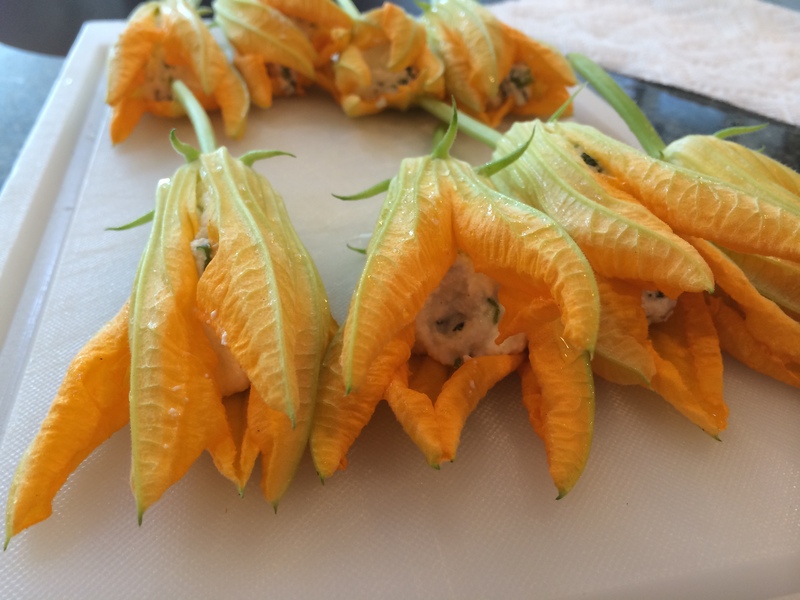 Since then, I’ve had squash blossoms in a stuffed and fried form as well as in pasta when I was in Italy. I was determined to make my own version at home. 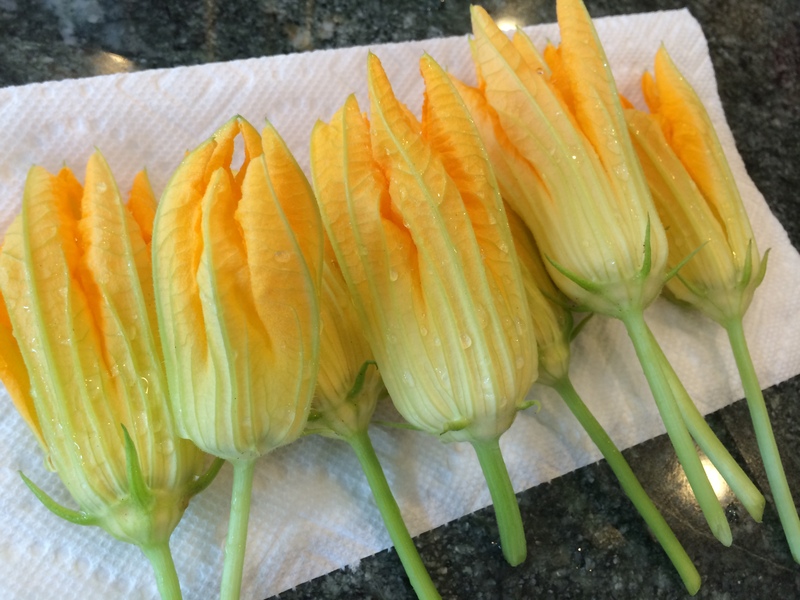 After a quick rinse, I removed the stamen from the flowers. 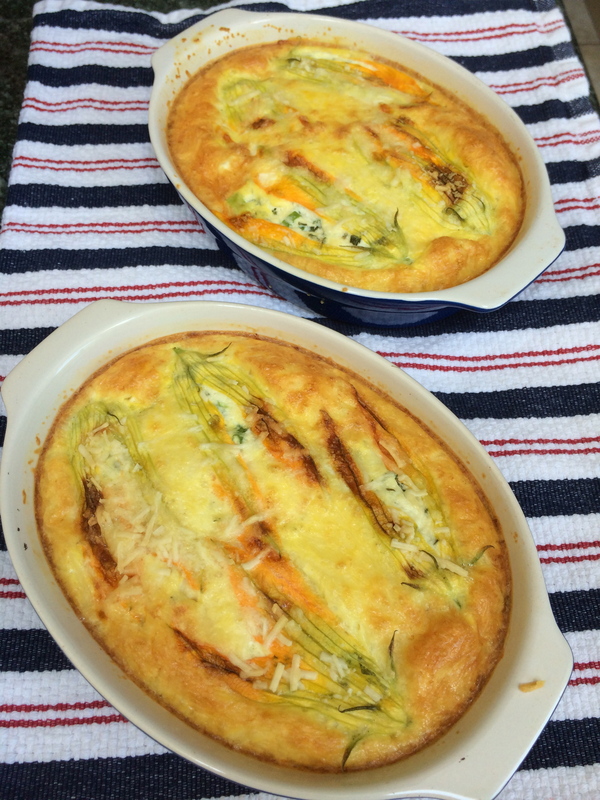 Then, I made a mix of ricotta cheese, green onions, and mint (also from my garden). 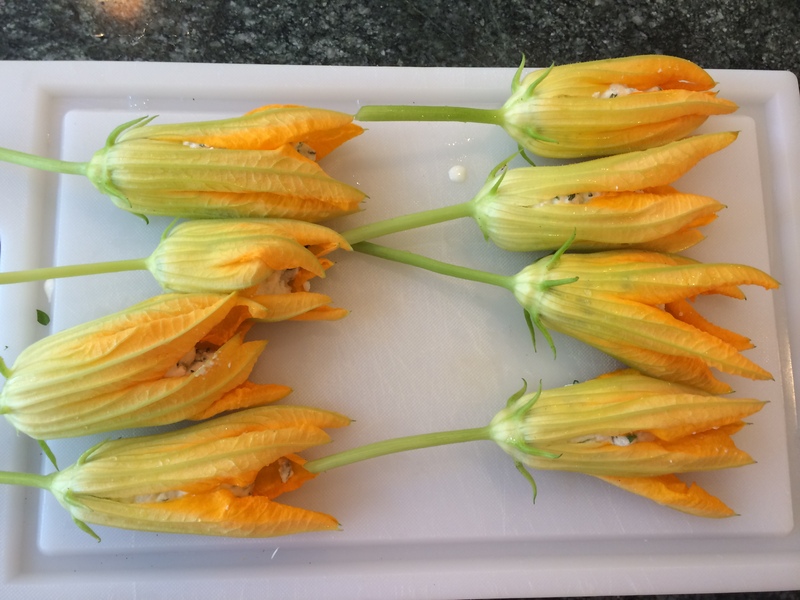 Using a piping bag, I filled each of the flowers with the cheese mixture, being careful not to break the very fragile petals. Next, they went into a small casserole dish. 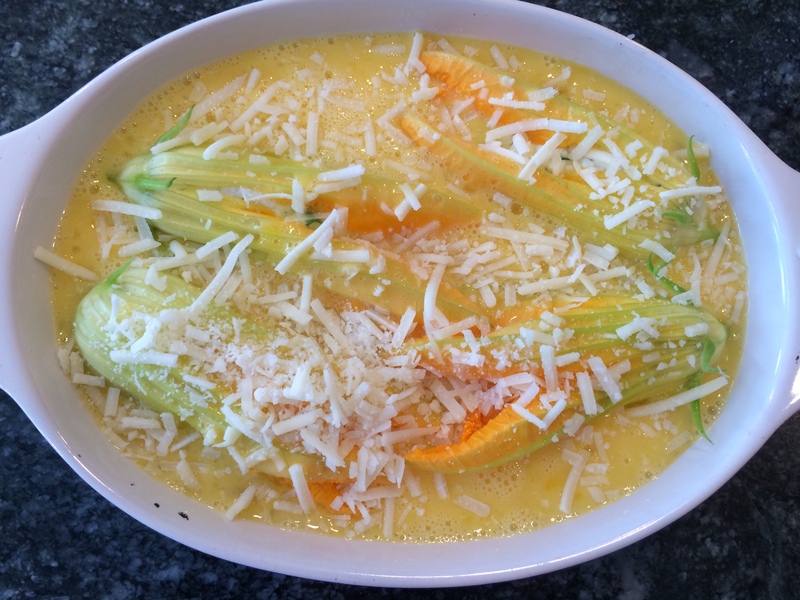 Into the dish went an egg and Pecorino Romano cheese mixture. The original recipe called for Parmagiano Reggiano, but since Pecorino was what I had, Pecorino is what went in. Topped with some more cheese, and then baked at 400 degrees F for almost half an hour, until the center no longer jiggled and it had sufficiently puffed up. So beautiful. And it was tasty too. Creamy, cheesy, with that delicate floral taste from the blossoms themselves. The egg was light and fluffy too. I was extremely pleased! Next, the Herbed Quinoa Salad. Chopped carrots, sliced tomatoes, and chopped basil (from the garden), green onion, and parsley were mixed together. I prepared the quinoa separately, chilled it, and then added a lemon herb vinaigrette. Next, I mixed the veggies and quinoa together. 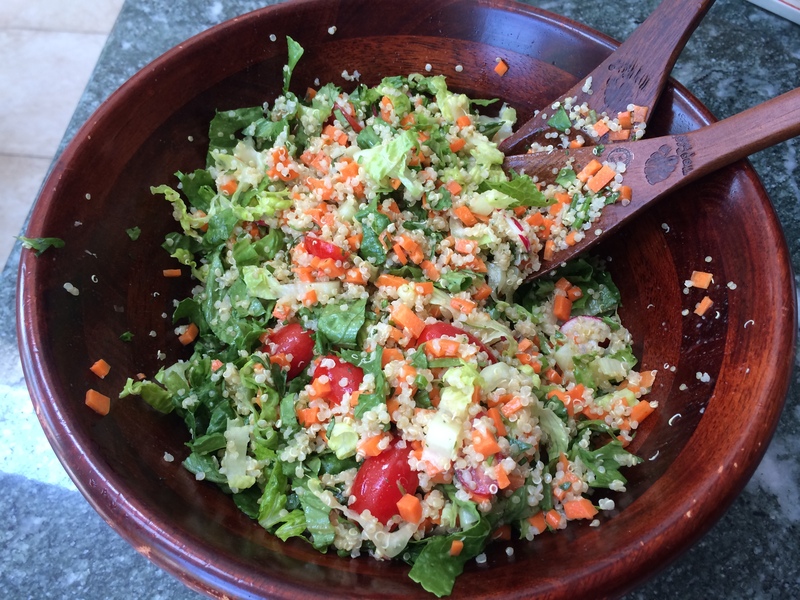 I sliced about 1 1/2 Romaine bunches into thin ribbons, then topped it with the quinoa veggie mix. Trying to keep the salad fluffy, I tossed the entire thing together. Really great flavors in this one. Definitely garlicky (thanks to the vinaigrette), but also the herbs were very prevalent and gave the dish a light and refreshing feel. 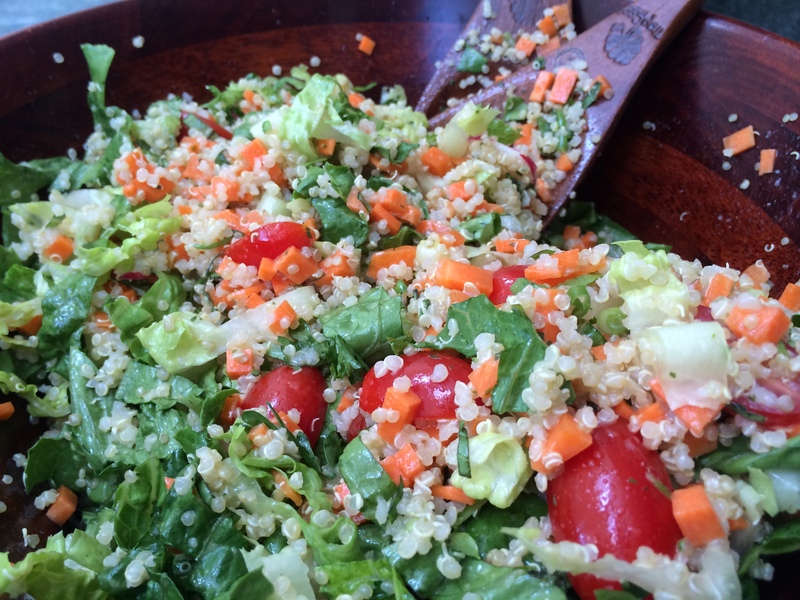 The crunch from the carrots was a great contrast to the soft quinoa and squishy tomatoes. Also, ribboned romaine was the way to go with this one. Finally, the Honey Sriracha chicken. 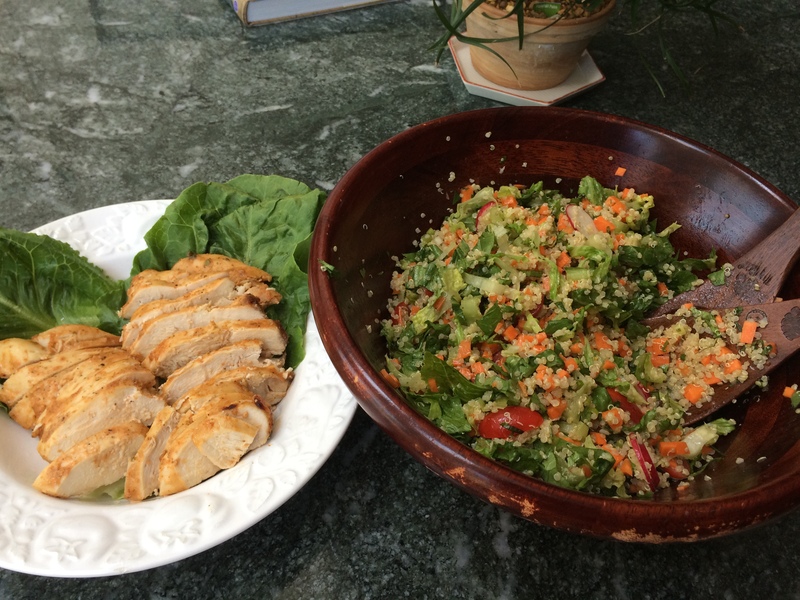 This is the same chicken I made for the quinoa bowl in my very first post – First Post: Quinoa Bowl. This time, I wanted to make sure I didn’t ruin another pan, so I baked the chicken at 350 degrees for 20 minutes, then broiled it for an additional 10. 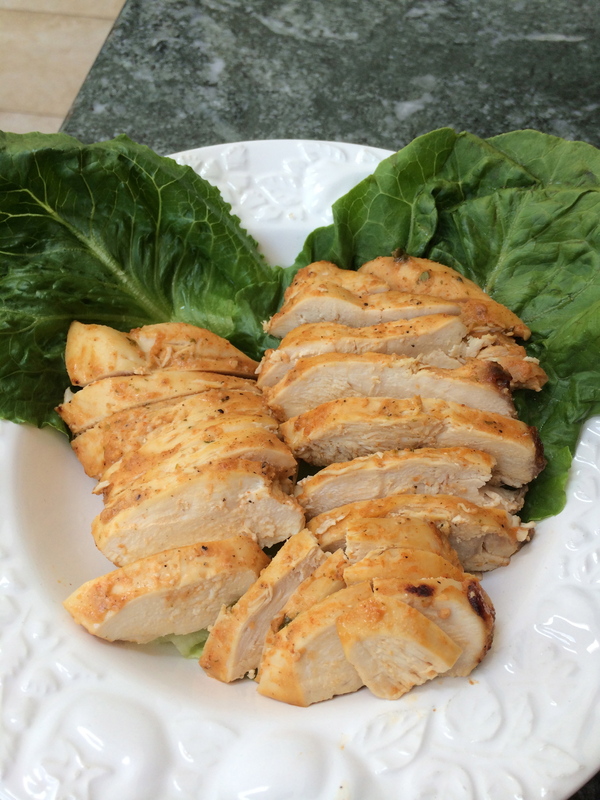 The final product was tender, juicy, and had a great kick from the combination of mustards and sriracha sauce. Here is everything all together in one glorious bowl.